What would you say to setting off for a camping holiday in Drôme? Cynthia, Mickael and their teams welcome you to the Yelloh! Village Les Ramières, in the pretty village of Sahune. With lavender fields and olive tree orchards, your holiday will be thoroughly countryside-focused! In an area of around 10 hectares, the camping Les Ramières offers customers high-quality accommodation which is terraced, making for wonderful views over the valley. You're going to just love its aquatic area, the river which stretches to the foot of the campsite grounds, its facilities and, above all, the warm welcome you receive. Here, the atmosphere is really pleasant and family-friendly. There's not a moment to lose, book your camping holiday in Drôme straight away! Lovely chilled campsite, amazing staff! Looking for somewhere to go for your next holiday? Dreaming of a bit of authenticity and wild countryside? Set off for a campsite in Nyons in Drôme Provençale, staying at the Yelloh! Village Les Ramières. Drôme is home to all sorts of historic, natural, gastronomic and cultural gems. 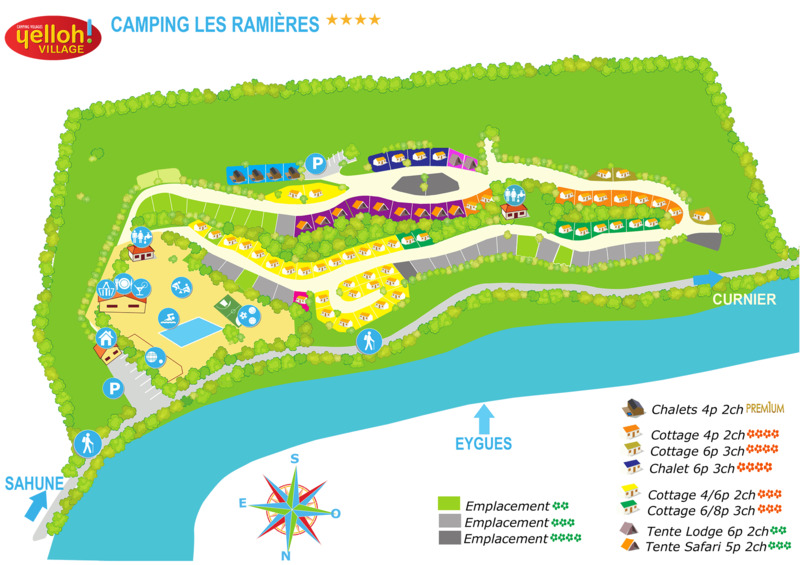 Come and discover these listed, perched and botanical villages during your stay at the camping Les Ramières. Head for Montélimar, the nougat capital! Wandering through its alleyways, you'll come across the so-called Maison de Diane de Poitier, the Domaine de Serre-de-Parc, the chapel of Notre Dame de la Rose and the Château des Adhémar, which puts on all sorts of shows. Stop off at Vaison-la-Romaine, and pay a visit to its mediaeval town, the cathedral of Notre Dame de Nazareth and its amazing Roman remains. And finally, head for Sahune, an ancient village with its old alleyways, shoemakers' workshops and church, which the whole family will love. In an amazing natural setting, the energetically-minded will be able to enjoy all sorts of different activities, including adventure tree-climbing, via ferrata, hang-gliding, climbing, hiking, cycling and horse riding. Everyone will find something to suit them! And foodies will love trying some of the local specialities, including honey, cheese, nougat and olives, as well as all sorts of other tasty things. Your camping holiday in Nyons will be packed with great discoveries!